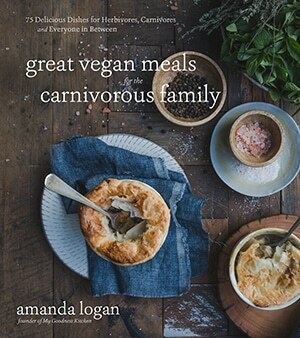 The kind folk at El Cielo let me choose from their range of products to create a delicious vegan family meal. While the Husband loves their traditional totopos, I wanted to try something a little different. Tostaditas are the Mexican equivalent of an open sandwich and are so wonderfully fun to make and eat; I challenge anyone to eat them daintily. My Black Rub Cauliflower Tostaditas are inspired by a Donna Hay recipe that uses coffee in a spice rub to blacken chicken. 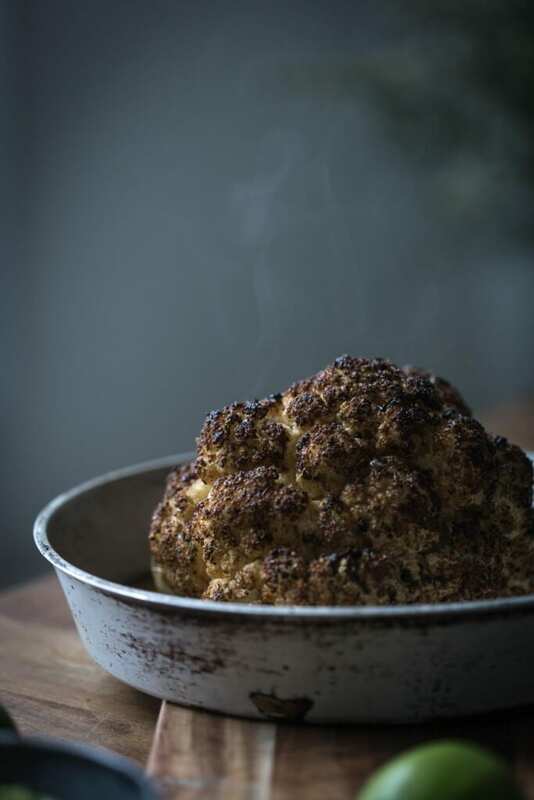 This recipe adds traditional smoky Mexican spices massaged in to a whole roasted cauliflower to create a black and spicy outer with a soft white centre. 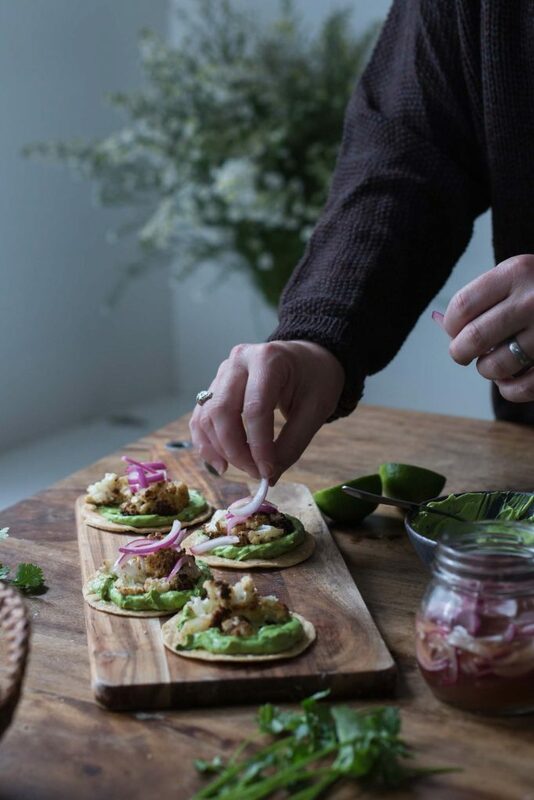 Add an avocado and coriander purée and pickled red onions and these vegan tostaditas are ready for the whole family. The humble cauliflower has made switching to a plant-based diet immeasurably easier. While my pantry is full of vegan must-haves like cashews, nuts, nutritional yeast and legumes, the lumpy cauliflower is my best friend in a culinary crisis. No chips in the cupboard to nosh? Break up a cauliflower in to florets, drizzle with olive oil and a good pinch of sea salt and roast until slightly charred. A bowl of these babies will kick chips to the curb. Got stock, cauliflower and cashews? Then you have a delicious creamy soup. I even use cauliflower in my vegan cheesy sauce instead of cashews. So good. 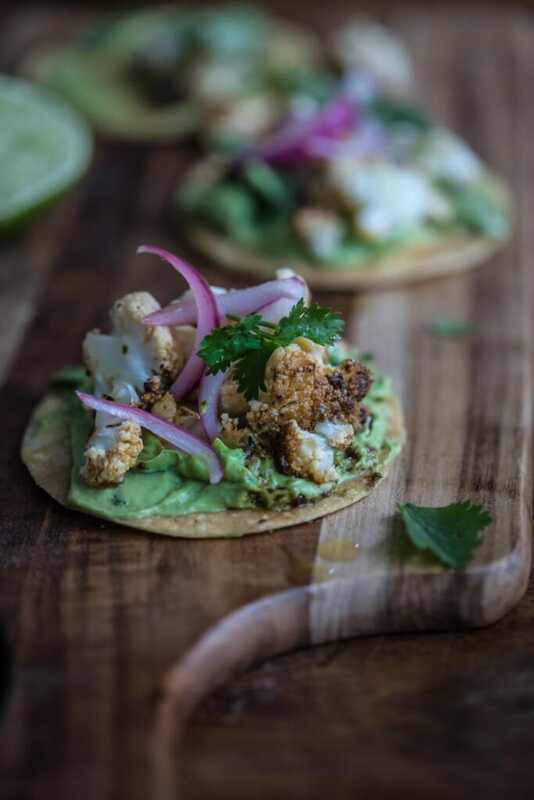 While cauliflower is in my top five ingredients to work with, Mexican easily makes it in my top five cuisines to cook so this Black Rub Cauliflower Tostaditas recipe is a match made in my belly. I hadn’t made or eaten tostaditas before, we usually buy the El Cielo totopos and corn tortillas, but tostaditas are such a fun change. Round deep-fried tortillas, tostaditas are usually served open with traditional toppings such as beans, pulled pork, chicken or prawn and salsa. My Black Rub Cauliflower Tostadita is not traditional, but I have to say, it’s bloody good. Firstly, you create an aromatic and smoky rub for the cauliflower including coffee, paprika, oregano, chipotle pepper, brown sugar and cumin. 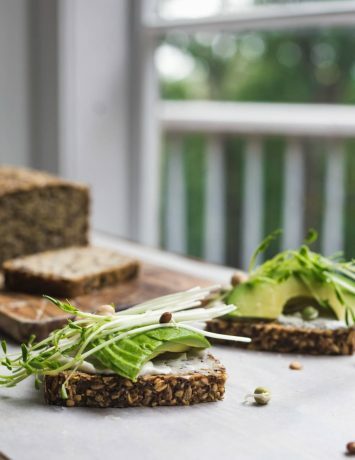 After roasting the cauliflower to charred perfection, it is served sitting on top of a wonderfully creamy avocado and coriander purée. Finished with a smattering of sweet pickled red onions and sitting happily on a crunchy tostadita, these little rounds are a flavour fiesta. Besides relishing every morsel of these tostaditas, my favourite part of this dish is that it is something my little clan can enjoy together. While the Elf didn’t eat the cauliflower – we’re not doing cauliflower this week – she loved the tortilla rounds with the avocado and coriander purée. The husband ate five tostaditas with an extra helping of the black rub cauliflower while I came in at three. I was full at two but the belly wants what the belly wants. Tostaditas are one of those dishes where you just have to forget table etiquette and enjoy the moment; there is no graceful way to eat these deliciously crunchy, Mexican rounds. My tribe finished our lazy Sunday lunch licking sticky fingers and wiping avocado puree from our chins. For a moment we were three kids at a table, messy, sticky but so happy. And I loved every second. 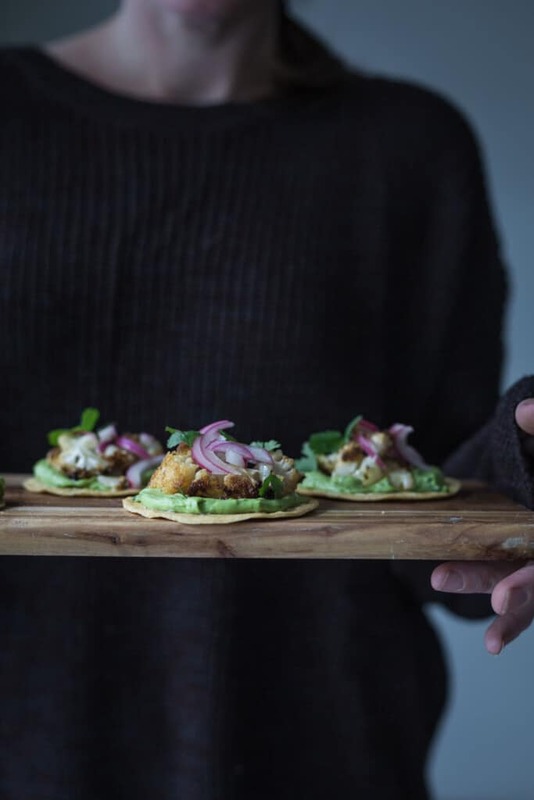 EL CIELO provided the tostaditas to create this recipe. While they were given gratis, we happily buy their products from our local food store. I will always advise when producers provide us with products to create recipes. 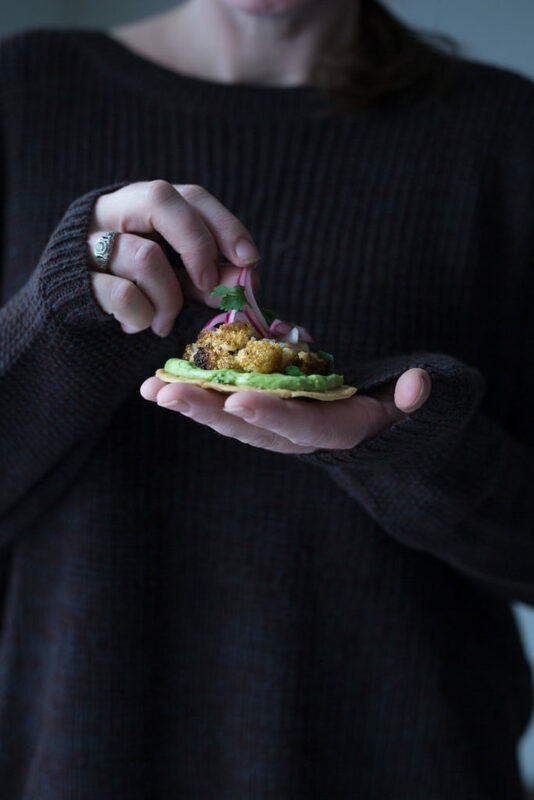 With coffee and smoky Mexican spices massaged in to a whole roasted cauliflower, these Black Rub Cauliflower Tostaditas are a vegan flavour fiesta. Remove the base of the cauliflower so it sits flat in a baking tray. Drizzle the cauliflower with two tablespoons of olive oil before massaging the rub all over. Roast the cauliflower in the oven for forty-five minutes to an hour or until a knife glides through the centre easily. While the cauliflower is roasting, peel and slice the red onion in to eight wedges. Combine the vinegar, sugar, salt and cumin seeds in a small jar and add the red onion to pickle. If you have a lid, put it on and shake. If not, simply stir and set aside until you are ready to assemble the tostaditas. To make the purée, put the coriander, avocado, lime juice and salt in a food processor and process until smooth. Add a teaspoon of water to help if needed. When the cauliflower is cooked, break it up into small florets. I use a knife and slice downwards; the cauliflower tends to fall apart. To assemble, spoon a good dollop of the avocado purée on to the tosadita, followed by the black rub cauliflower. Finish with a smattering of the pickled onion and fresh coriander and a squeeze of lime. If you don't have chipotle powder, replace this and the paprika with two teaspoons of smoked paprika. This sounds like a brilliant combination! Very inventive, I can’t wait to make it! Sylvia, I love this recipe and I hope you do too. Let me know if you do make it – I’d love to hear how it goes. Thanks Amber. It is a pretty neat trick and gives the rub a lovely deep flavour.